This is a wonderfully simple idea for a cowboy diaper cake! Crisp red ribbons contrast with the stark white diapers. The cute cake toppers are the perfect touch, and with 3 different diaper cakes, it makes it a very attractive focal point for the baby shower! Leave it to a Texan to send us an adorable cowboy-themed diaper cake. Love it! Kim, thank you so much for sharing your creative diaper cakes! Join our growing list of submitters by sharing your diaper cake photos and ideas. We'd love to post 'em! 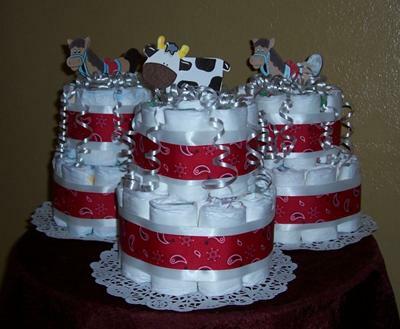 Diaper cake has 20 diapers, white ribbon and red bandanna ribbon along with a horse or cow topper.